How many women does it take to ruin a marriage? Eric Hayes is a man with too many women in his life. As a bachelor, he loved all of the attention, but now being a married man, he quickly realizes that he cannot please more than one woman at a time. Succumbing to the pressure, Eric takes a course at his wife’s church to become better equipped for the bittersweet realities of marriage: Husband 101. The course ends up being more than he bargained for and his role and actions as a man are put to the test, one that he struggles to pass. Unable to keep everyone satisfied, Eric’s picture-perfect life begins to crumble even before he can make it to his first anniversary. Will he heed to good advice and put into practice the lessons that can salvage his family, or will pride and self-reliance guarantee his fall? To say I was excited to read Husband 101 by A’ndrea Wilson would be an understatement. Since reading Wife 101 (which was released in November 2011), I have been telling everyone I know about Wilson’s work. Husband 101 continues the story of Amber and Eric who are now married and expecting their first child. Eric thought he knew all there was to being a good husband but when Amber urges him to attend the Husband 101 at her church, he realizes that he was deeply mistaken. Eric’s ambition to be a success on his own causes him to go down a path that blurs the line between bending the truth and telling a lie. Throughout the thirteen week Husband 101 course, Eric reevaluates, reexamines, and reassess his views on marriage and his role and responsibility as a husband. Husband 101 clearly looks at the topic of men and marriage just as Wife 101 explored women and their role in marriage. Both books are work of fiction, but each chapter teaches a lesson that ministers to your soul and gives you a greater understanding of the words written in the Bible. Like its predecessor (Wife 101), Husband 101 is one of my favorite reads in the last twelve months. Couples 101 cannot be released soon enough! 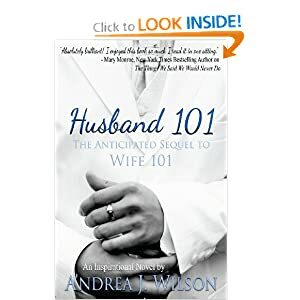 Purchase Link: Husband 101 by A’ndrea Wilson can be purchased on Amazon by clicking on the book cover at the top of this post. I recently had the pleasure of hosting a tour stop for Winter’s Magic by Cynthia Gail. 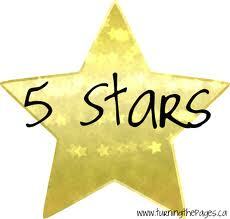 I thoroughly enjoyed the book and you can read my review which was posted on November 30, 2012. Cynthia also stopped by for a little chat, so here we go! I read Nancy Drew and Beverly Cleary in grade school, a few teen romances in middle school, but then I really stopped reading until the age of thirty. I was working in the magazine/book industry and found audiobooks were a great way to relax during a long commute to work. I read mysteries for several years. Then a book publisher gave me an autographed copy of Lisa Kleypas’ Sugar Daddy and promised I would love it. I sat it on my office bookshelf for a year until I saw a marketing sheet on Blue Eyed Devil. I was hooked and quickly found her Wallflower series, then went through all of her other historicals. I haven’t read many mysteries since. A few years ago, my husband worked the early morning shift and went to bed at eight. I’m a night owl and would stay up late reading. One day I woke up with a storyline in my head. After a few days of the story growing, one night instead of reading I decided to write. I didn’t tell anyone I was writing for a year and by then I had 2 1/2 manuscripts finished. I told my best friend, who happens to know Trish Milburn, an award-winning author, and hooked me up. Trish edited my first book (what is now the second in the series) and connected me with RWA and the Nashville chapter. I follow Lisa Kleypas, Eloisa James, Julia Quinn, J.R. Ward, Susan Mallery, Karen Marie Moning, Suzanne Brockmann, Jennifer Ashley, Emma Wildes, Anne Stuart, Sabrina Jeffries, and Victoria Dahl. And that’s just a start… Darcy Flynn, Rebecca Heflin and Meggan Connors are brand new authors recently added to my list. My all time favorite is Can You Keep a Secret by Sophie Kinsella. I also love Intensity by Dean Koontz. I’ve read the Twilight series at least four times. Lisa Kleypas’ Wallflowers and Travis series and J.R. Ward’s Black Dagger Brotherhood would also have to be at the top of my list. 6. What would you like for readers to get out of Winter’s Magic? Winter’s Magic is a fun, fast read. There are parts that will make you laugh, while others make your heart squeeze. A few surprises. Steamy love scenes. Each one touches on modern day issues, fears, and challenges that women face every day. And each one illustrates that love is within reach if you let down those walls and allow your heart to open. Our lives and experiences are so much more meaningful when we have someone to share them with. I couldn’t have asked for better feedback. Reading is supposed to take us away from the stress of our lives and treat us to a few moments of escape and happy endings. I hope all of my books succeed in providing this. I have to have complete silence and plenty of light to write. My creative side requires total concentration and absolutely no multitasking. I have a lounger in the family room and a recliner in the bonus room, depending on where the family is—both allow me to put my feet up and relax with my laptop. Once I’m finished with a manuscript and start the editing process, I can simultaneously watch a football game, sitcom, and handle music and noise. I guess it’s just a different part of my brain. Spring’s Surprise is under contract and expected to release in March or April of 2013. Summer’s Family Affair and Fall’s Redeeming Grace will conclude the Music City Hearts series. I also have a stand-alone book called Sweet Tooth that I’m working on. Angela Preston is a single mother, struggling to make ends-meet with a bakery and catering business. When her car is totaled by a local delivery truck, she meets Lance Stone, whom she assumes is the driver’s regional manager. He eats lunch at her diner several days in a row before she finally agrees to a date. Only after she’s given him her heart does she realize he’s the CEO of the company who’s planning to tear down the blind school her son attends. 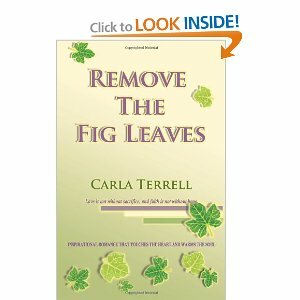 Married couple, Lola and Pete are the main characters in the debut novel, Remove the Fig Leaves by Carla Terrell. Lola and Pete have been trying to conceive for 5 years and so they went to see Dr. Good who is one of the best infertility specialists in their area. Over the course of time, Dr. Good falls in love with Lola and then as a result of his treatments she becomes pregnant with twins. Some would say it was a twist of fate but two months after the couple is able to conceive, Pete dies from a brain aneurysm. The book seems to jump months ahead at a time in between chapters. Dr. Good’s nurse, Geraldine, encourages him to pursue Lola but there is another man in the picture. Dr. Good and Lola both must learn to remove the fig leaves of doubt, fear, and excuses and must choose to claim God’s most precious gift: love. There were a few spelling errors but they were not major enough to distract from the storyline. Remove the Fig Leaves is a relatable and understandable story because like most of us, both Dr. Good and Lola were guarding their hearts and would not let go of different things of their past. Carla Terrell has written a Christian fiction story that is inspirational and lays the foundation for a very promising writing career. Disclaimer: Read it All Book Reviews was given a free copy of this book from the author. We were not compensated for the review. Headline: Girlfriends to the End! 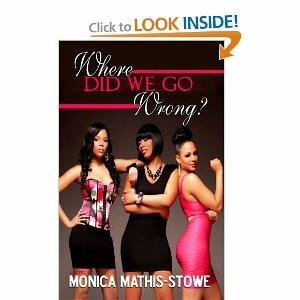 Monica Mathis-Stowe writes a story that most women can relate to in Where Did We Go Wrong? Gabby, Maxine, and Joy believe they are thick as thieves but what happens when the ties that bind are challenged. Gabby is the diva of the bunch. She is determined to get whatever she wants at whatever cost normally forgetting about that little word called karma. Maxine is the one that seems to have the perfect husband and family life but everything changes when she finds out it was all an illusion. And, Joy has an overbearing mother who controls her even as an adult. Monica Mathis-Stowe has done an excellent job at developing the characters as I could relate to an aspect of each of them and could feel their pain as well as their victories. Where Did We Go Wrong? is full of drama and will keep you excitedly turning the pages. I look forward to reading more work by Monica Mathis-Stowe. Disclaimer: Read it All Book Reviews was given a free copy of this book from the author. We were not compensated for the review. If you would like to have your work and/or your clients reviewed, please send an email for submission guidelines. Joseph and Sally Lassiter have twelve children and Teach Me by Iris Bolling is the story of the fifth child, Diamond. Diamond is beautiful, intelligent, and is ready for love. Enter Zack Davenport. Zack enters into Diamond’s workplace and he is loud, rude, and very obnoxious but somehow she finds herself attracted to him. Diamond is determined to have Zack in her life but she is new to love and relationships. But, with the simple phrase of “teach me how to love you,” a romance blossoms between the two. Ms. Bolling writes a story that is full of laughter, struggles, realistic situations, and it leaves you waiting for more. This was my first time reading Ms. Bolling’s work but it will definitely not be my last as I plan to now read the entire “Heart Series” so I can get familiar with some of the characters. Just remember when you think you are the one being the teacher, you might end up being the one who learns a lesson!